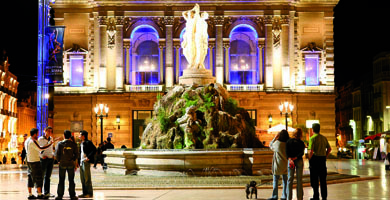 Francophile Jennifer Evans Gardner hits the City of Lights for a festive gift-buying spree. It’s that time of year again. The malls are packed with shoppers converging upon the usual suspects like The Pottery Barn, Banana Republic, and Victoria’s Secret in search of holiday gifts. The thing is, I’ve never been a mall girl, preferring to do my gift buying in charming sidewalk boutiques. Imagine the thrill I got last week when I got a call from a close girlfriend, inviting me on a last minute holiday shopping trip to Paris: 5 days, 4 nights – all expenses paid. With work deadlines, high school applications to fill out, carpool duties and other assorted motherly responsibilities at hand, I did the only sensible thing. I packed my bags. The great thing about traveling before the holiday rush is that you have a good chance of getting upgraded on your flight. The stars were aligned for me, and I found myself in Air France’s posh Affaires class, blissfully indulging in champagne, cheese and chocolate while brushing up on my français with a few French films. After a restful night, I awoke in the City of Lights, bright-eyed and ready to meet my friend for our shopping adventure. For those not on a budget the Park Hyatt Paris Vendome is a splendid place to stay with its chic lobby and Degas-inspired sculpture doorknobs. It felt exhilarating to park my luggage smack dab in the middle of Paris. However, for my dollars, I’d rather sleep steps away at the Hotel Mansart sans the cool doorknobs. Though not as posh as the Hyatt, the Hotel Mansart is equal in terms of central location, friendly staff, and comfortable rooms; however, at a savings of about $500 a night (that’s $2000 for four nights! ), I’d rather put my Euros toward shopping. We couldn’t wait to get started. Spending money is always immensely fun in Paris, but in December when the temperatures go down and the holiday lights go up (not to mention the added obligation to shop for others), it’s sheer bliss. The Champs Elysees, Place Vendome and Place Madeleine are just some of the quartiers decorated with elegant lights in colors like lilac, rose and blue, and the scent of freshly roasted chestnuts and toasted sugar almonds puts you in a festive mood. What could be lovelier than meandering through the Marais, St. Germain, or along Rue St. Honoré with one of your dearest friends, popping in and out of picture-perfect boutiques, warming up along the way with a croque monsieur and sinfully rich chocolat chaud at the stunning Angelina tearoom? What could be dreamier than a two-hour lunch in the Palais Royal at the exquisite Le Grand Vefour, where Napoleon, Victor Hugo and Julia Child, among others, have dined over the years? Or a visit to Didier Ludot, arguably still the best vintage designer shop in the city, just steps away? Women cannot live on shopping alone, though, so we popped into some of our favorite museums, the Musée de l’Orangerie, Musée d’Orsay and the Picasso Museum (now closed until Spring 2013)… even taking in a few hours of the sensational Paris Photo exhibition at the Grand Palais. A brisk walk through the Jardin des Tuileries between the Louvre and Place de la Concorde amidst bare, wintery trees felt magical, followed by a comically jam-packed rush hour Metro ride (with what seemed like all of Paris) to visit a friend in Neuilly. For me, no trip to Paris would be complete without visits to Fauchon (where I stocked up on expensive foodie gifts for my son’s teachers) and the Monoprix (where I stocked up on inexpensive foodie gifts for myself). Of course, it would be impossible to name all of the memorable boutiques in Paris, but here is a list of some of my favorites, where you’ll have no trouble finding something for everyone on your list. In the end, it doesn’t really matter what you buy or for whom. A last minute holiday shopping trip to Paris is really the perfect gift… for you. Palais Royal: Built in the 1600s as a residence for Cardinal Richelieu, this beautiful historical palace and gardens is in heart of Paris. Inside and adjacent to the beautiful courtyard, there are a few restaurants (including Le Grand Vefour) and boutiques selling clothing, jewelry and antiques. The Monoprix: The best kept secret of Parisians, most Americans know nothing about this Target of Paris, where you can buy everything from cosmetics and clothing to French toys and those cool school notebooks, at great prices. Downstairs you’ll find the grocery section, where jars of mustards and jams are a fraction of the price of Fauchon, and absolutely delicious. Grab an almond croissant for the road… they are delicious. Museum Gift Shops: Museum gift shops such as that found at the Musée d’Orsay, the Louvre and the L’Orangerie are chock full of reasonably priced gifts such as books, puzzles, toys, and art-inspired pens, barrettes, jewelry and more. Mod’ Shop: Along the Rue De Rivoli, right near Angelina, you’ll find this little shop full of jewelry and gorgeous French silk scarves in pretty colors and patterns. Your cousins and sisters will love them, and they’ll never know they cost just 10 euros each (approx. $13). For those in the elite 1%, grabbing a last minute first class ticket is a breeze, and a perfectly acceptable alternative to the private jet. Air France offers the quickest direct flight over the pond daily – just 10 hours, 30 minutes (my sleek Boeing 777 got there in 10 hours, 15 minutes), and as of May 2012, they’ll be starting service from LAX to Paris with the new A380. A round trip voyageur ticket (that’s economy class—doesn’t everything sound better in French?) will run you around $959 right now. However, for a spontaneous trip to Paris, perhaps you can splurge on a gift for yourself: Air France Business Class. For $10,000 (round trip)—or perhaps by upgrading with Flying Blue miles, you’ll get a comfy seat that transforms into an even comfier bed; feather pillow and blanket; on-demand TV with noise-canceling headphones; a Clarins amenity kit, fine wine and of course, gourmet meals. What a great article. Such useful information. I can plan a whole trip around this. And yes, the falafel will changer your life. I want to go!!! Loved this article — trying to keep my feet firmly on the ground here so I won’t suddenly drop everything and run off to Paris RIGHT NOW!